Rodney is a grain farmer with a small herd of cattle and a DeKalb/Asgrow seed business. He lives just one half mile from where he grew up. He graduated from Union High School in 1977, then attended Quincy Technical Mechanic School for one year. 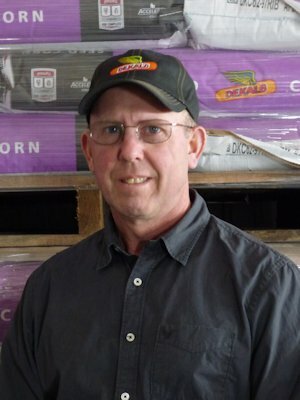 He worked for Craigs/Cameron International in Biggsville from 1978-80 and then began farming a small acreage while working nights at Wilson Foods until 1987. He then began full time farming and has been selling DeKalb/Asgrow Seed for the past 25 years. Rodney enjoys time spent drinking coffee and socializing with neighbors and friends. He said that he has learned so much from the seed business, just from listening to and working with his customers over the years. "Our community really has a lot of great people in it." Rodney really appreciates all of his wonderful landlords for giving him the opportunity to farm their land which in turn gave him the chance to raise his family on a farm as he was raised. Rodney's mother, Leta Fell (Jim), lives just outside of Smithshire and recently retired from Twomey Company. His father, Merrill Martin, lives north of Monmouth and is still actively farming. Rodney has one sister, Pam, who lives in Galesburg and works for Tri-State Waters. He has two brothers, Rick, who lives near St. Louis, Missouri and does construction work, and Scott, who lives in Monmouth and is the maintenance supervisor at Well's Pet Food. Rodney met his wife, Maria, from Colombia, South America, when she was an exchange student at Roseville in 1981. They married in 1983. Rod says, "Maria is one of the most amazingly wonderful individuals that you will ever meet." She was a stay at home mom until the children were almost out of school, and then began teaching at Monmouth/Roseville District for a few years. She has been at West Prairie School District for the past 5 years and teaches Art and Spanish at the high school level in Sciota. Maria really enjoys the students and often comments at how great the West Prairie administration is to work for. Like any other parents would be, Rod and his wife, are very proud of their three kids. Lucas, their oldest, is married to Beka, lives in Napoleon, North Dakota and works at Napoleon Livestock Company. Beka is a stay at home mother and plans to homeschool their children (Caleb 2.5 years old and Zelie 9 months old). Anita, their middle daughter, is married to Vincent Kubishta, lives in the Biggsville area and teaches first grade at ICS. Vincent has an agronomy degree and works at CBG now, but hopes to take over the family farm in Hope, North Dakota some day in the future. Sara, their youngest, is married to Jacob Shaner and lives in the Biggsville area. Sara works on the ambulance and in the emergency room at Carthage Memorial Hospital. Jacob also has an agronomy degree, farms with his father Roger and grandfather Wendell, and does custom round baling on the side. He also has visions of taking over the family farm someday. What does Rodney enjoy the most about farming? "Everything, absolutely everything," he said. "I have many enjoyable memories as a child of raising hogs out in the open fields, square baling hay and walking beans, which you don't see much of today." "Farming can be very challenging at times, but it can also be very rewarding. It's hard to explain the wonderful feeling of saving a new born calf on a cold rainy night or raising a bountiful crop after an awful adverse growing season." Rodney feels so fortunate to have farmed in the past 30 year time frame. "I grew up between two totally different periods of farming. Before me, everything was pretty much done by hand (milking cows by hand, carrying water to the house by pails, picking corn by hand, etc.) Hopefully, all of my equipment will last until I quit so I don't have to learn to operate everything with a computer. It used to be when a farmer had a problem he would try to solve it on his own. Now days if you look hard enough, it seems like there is an app or computer program to explain everything you need to know." With that being said, he is also disappointed in the direction farming is taking. By that statement he is talking about the size of acreage that some farmers are attempting to operate and all the new advancements in technology used in farming today. "I am not saying that any of the new technologies are bad ideas," Rodney said, "I'm just not sure if they are truly needed. The newest one that comes to mind is robotic unmanned tractors." When asked if there is anything that he could change about farming he said, "Investors investing in farm land and co-ops. I think most absentee land owner/investors, are only interested in one thing - return on investment. Many could care less about who farms the land or how it's taken care of. There should be some award type of recognition for all the land owners that have chosen to stay involved and continue renting their property 50/50 or at a reasonable cash rent to young farmers in their local communities." "If we want our communities to stay good and strong, we all need to work together in trying to keep the great young kids close to home." Rodney has his opinions abut large mega co-ops. "In my eyes, co-ops have destroyed a lot of our small rural community businesses, just like Wal-Mart has devastated a lot of our small businesses in urban areas. The sad thing is that we all, including myself, are guilty of catering to these businesses. You know how some large farmers will never be happy because they will never have enough land. It seems like co-ops are the same way. They are continuously merging or consolidating with each other to become bigger and stronger. Large corporations are no different. Why have we allowed them to get so big and powerful? Small businesses don't have CEO's and high paid executives that scrape the cream off the top. Small businesses don't look for ways to leave the country for cheap labor. Small businesses keep American employed. Small businesses are not prime targets for other countries to purchase. Unfortunately, small businesses can't afford lobbyists to get our congressmen's attention. I'm not against regulations but I am against excessive regulations. It almost seems like our government does everything humanly possible to discourage anyone from being in business. I wish that I had the talent of the Barnyard Bruke to express my thoughts without sounding so negative." Rodney realizes that we can't go back in time, but maybe each one of us can support what few, businesses we still have in our communities so that they may survive a little bit longer. Victor Twomey once wrote, "Our country was developed by individuals in business; let us keep it that way." What a remarkable statement that was. Rodney ended his comment with a recommendation. "I still believe we are all living in the best country in the world, but it also being challenged continuously. We all need to pay close attention to who we are voting for and putting into office. If anybody reads this article and is undecided on who to vote for in the 94th district for state representative, I strongly urge you to consider Marshal Schrader. I have known Marshal for quite some time and he is an outstanding honest person with great values. He thinks that we need some changes, and I agree. He is willing to work hard and spend whatever time it takes to try and make a difference in our country."